In one of his comedy routines, Ray Romano speaks about the relationship that Italian-American moms have with food, especially when they have guests. At one point, he says that if guests would like another helping, they should say they want no more, because the host would insist in giving you a little more. I can definitely relate to that, because Brazilian moms – probably because of their Portuguese heritage – are pretty much the same. I recall stopping by my grand-aunt Maria’s home for her birthday party just to say hi and wish her a happy birthday, and when I got there I saw this huge table with a variety of dishes. After talking to her, I got myself a drink and found a place to sit. “Aren’t you going to eat?” she asked. I said I wasn’t because I’d already had a bite somewhere earlier that evening. She smiled, walked away and grabbed a plate. Naïve as I was, I assumed that she was helping herself, but after she had piled the plate with a huge serving big enough for about three people. After that, she turned around, shoved the plate into my hands and commanded: “Here you go – now eat,” and stood there until I had cleared at least half of the food. Now I am not sure if the culture is the same in other regions of Brazil, but in the northeast it is really offensive not to eat at a party – they will make a lot of food and you are expected to eat it even if it is served as late as 9 or 10 PM. Worse, if you don’t get a second helping, the host will be offended and claim that you didn’t like the food – which was exactly what happened one year when my then-girlfriend and I drove to the nearby town of Aquiraz to my aunt Telma’s home during Carnaval on my old VW Beetle. We got there just in time for lunch, and as far as I can remember there was grilled chicken, farofa, rice, beans and maybe salad. My girlfriend was a bit of a difficult eater, so she picked her way through the food and ate very little as a result. My aunt just looked at her and said she’d be ‘hungry,’ and proceeded to fill her plate just like happened with me a few years before. The last time Renata and I were in Brazil, we contributed to a dinner party for friends and relatives (cannot remember the occasion, please remind me if you were there). I cooked a couple of meatless dishes which were consumed voraciously by those present – All had great things to say about the food, but one thing I am glad was that I cooked more than I thought I would need, since there were no leftovers. So the bottom line is: if you happen to be invited to a dinner party in Brazil, don’t be shy – eat until you are full with no American shyness and enjoy. The last thing you want is for the host to make you an extra – and very large – plate. 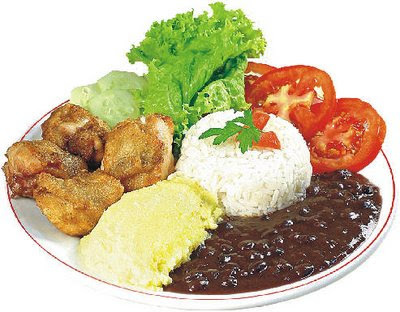 Farofa is the major side dish in Brazil, and it goes with everything. If you cannot find cassava flour, you can use raw farina – the flavor is very, very close. 1. Add the onions and cook until very soft and golden, about 10 minutes. 2. Stir in the manioc flour and cook, stirring, for 3 to 4 more minutes until well mixed and evenly toasted. 3. Season with salt and pepper to taste. Stir in optional black olives and/or hard boiled eggs if desired.